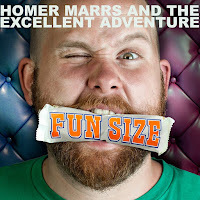 Homer Marrs has been a long time friend of the blog and it's been amazing watching him grow into the artist he is today. At first glance, he could be taken as a comedy act but if you look deeper and actually listen to what he has to say, he's irreverent and he lampoons social conventions and norms with his music. Fun Size is a 5 track album (plus a remix of "It's Amazing") and each track has this amazing ability to be exactly what you need out of a song at the moment you need it. I've made vocal comparisons of his music to acts like Flaming Lips, They Might Be Giants, and The Violent Femmes. Those are not comparisons I make lightly because each of those groups have the ability to transcend their proposed genres and be something larger than they were intended to be. I feel very strongly about this EP as well. The social commentary in "It's Amazing" and "Smile. You Have Depression" is incredible. They're songs that actually challenge you to take a look at how we deal with this situations. Whether it be how vapid the world feels or how ameliorated we are supposed to feel through modern chemistry, these songs make you think about how our society is skewed on either axis. "We're Wild" is yet another example of intelligent song writing as it tells the story about meeting his in-laws for the first time at a zoo. You have to listen to the song to get the full experience so I won't ruin it but any song that makes a reference to Dario Argento is an absolute winner in my book. "Destroy You Whole" is probably my favorite track on the album because there's something about it that I can relate to on a very personal level and I think that most people who are of dating age can find some part of it that touches you (for better or worse). While "Candy & Demonology" is the dichotomous sister "Destroy You Whole" - where "Destroy You Whole" is an illustration of the ending of things, "Candy & Demonology" is full of hope and the wistfulness that a new relationship has. There is an undercurrent of humor to all of Homer's music but I think there's much more to him than just a comedian. I feel that by layering the irreverence over his message, it makes it a bit easier to take. A spoonful of sugar, if you will. Some of the topics he addresses are pretty heavy so if you can take the sting away just a little with a verbal prestidigitation, you don't realize that you've experienced something profound until you've had a bit of time to digest it. Emotional Wine Coolers. You don't realize how you've felt things because the fruity nature of the beverage hides the alcohol. It's actually very clever and well thought out if you look at it. Support this Chicago based artist because he's amazing and has a lot to say even if you don't know that he's saying it.